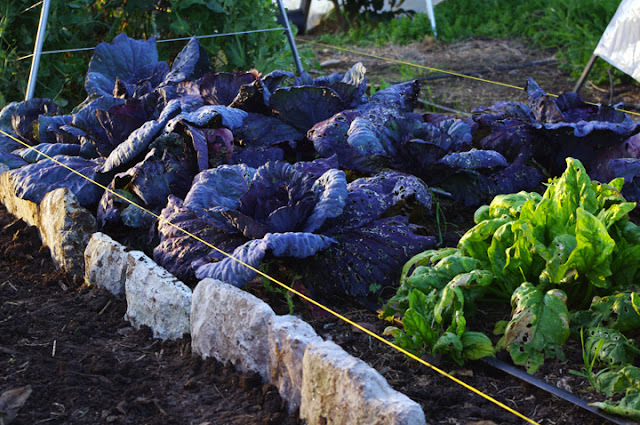 There are many types of vegetable gardens out there from the traditional rows – one plant wide row with walkways in between – to raised beds (and wide beds) or more natural, loose organic gardens. I try to stay away from rows because they are much less space efficient than the other two types. With rows you end up devoting a lot more land to walkways, which isn’t a good use of space if you’re trying to maximize your harvest. They do make harvesting easier and are better suited for using equipment which is why some people still use them. 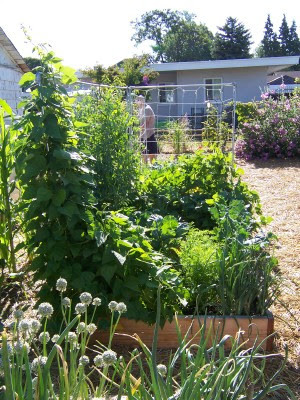 At our old house we used raised beds which have many benefits. You can lay hardware cloth (metal mesh) and weedblock under them to keep out gophers, voles and weeds. They are the perfect solution for problem soils whether you’re dealing with heavy clay or lead contamination (use filter fabric underneath to keep soil from migrating into the bed). They can be used on slopes as terraced beds (just make sure you have proper supports to hold the weight of the soil). 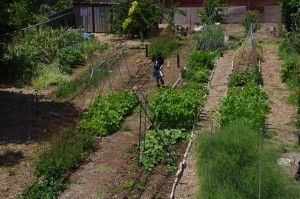 Organic, loose garden beds are a personal preference for many people. Lines are not straight and the plants are not organized into rows. I do really enjoy the looks of these types of gardens because they are productive while also being very aesthetically pleasing. There is usually more mixing of plants since rows are being utilized which can be very beneficial in regards to companion planting and confusing pests. We currently use wide beds. Raised beds are cost prohibitive at our scale and rows don’t produce enough. A 4′ wide bed can produce 4x more produce than a row of the same square footage. Plants are closer together (no walkways in between) which means less weeding when the plants get larger and shade the soil. Of course what you choose to go with is totally up to you because it really is personal preference. As much as I love the organic flowing look I’m just too OCD to try it. My new garden is sixteen 4×25 ft raised beds without wooden walls. Paths are about 18 inches. I love that loose organic look, too, but am also too OCD to veg. garden that way. The new forest garden that I’m developing against a fence is 12’x 60′. It will be looser and more organic feeling and looking. It is 6 keyhole gardens in a line. Everything planted there now is in its infancy but in a year or two should be looking better. Enjoy your posts! We do mostly raised beds here because it keeps our dogs from running straight through the veggies. Also, I like it better than planting directly in Davis’ hard clay soil. If we hadn’t found old redwood deck boards that were otherwise on their way to the dump, though, it would have been cost prohibitive for us too. We have a mix of raised beds. Our garden isn’t as large as yours, so it is still practical, and we let our chickens and cats run around our garden, so we have to have short aviary netting fences around each bed to keep them out. We also have narrower beds and some very high beds (36″ high) for every day items like salad, because I have a bad back. I can’t be leaning into really deep beds. I too love the look of meandering organic gardens, but it’s not practical for us when building raised beds.